Just saw the CD in the local music shop, shrunk wrapped. Anyone obtained it and can tell how the packaging inside is done - lyrics, essay, many photos of the band in this CD reissue? There're already pictures of it on [www.Discogs.com] . Basically the new remaster is louder than previous remasters with peaks heavily limited. Usually the result of this kind of loud remaster is a flat sound due to lack of dynamic range. To me this is what's happening here. Edited 2 time(s). Last edit at 2018-12-07 01:50 by kowalski. Clever observations, and really well written (imo). but apart from that, I think this one sums it up quite nicely really. Well, you can say - they were trying to make it sound like old AM radio . Also, they cleaned glitch in Stray Cat Blues at 2:19 (the one that was very obvious at 2002 remaster) but add a new one at 2:01. I had sworn that I wouldn't buy the BB release as it had very little in the way of worthwhile extras . Having had the opportunity to pick it up for the right money...I took the plunge and bought the vinyl. Suffice is to say that I was very wrong ! The sound is superb . Probably the best sounding BB on vinyl since the original 60s pressings. Actually Sounds like it was done by folks who care. Having bought this album many times over the years, I couldn't seen my way clear to buy a physical copy of this re-release, what with the garbage ABKCO packaging and all, but I did spring for buying the tracks on iTunes and then burned them to CD and printed my own "r.s.v.p." cover. Some of it works very well and sounds more brilliant than ever before, and some of it seems so widely panned that it's distracting. As someone pointed out before, "Factory Girl" sounds amazing on this 50th anniversary CD, like I'm sitting in the middle of a drum circle. But other tracks seem so drastically split that I don't get the direct power that I get from either the 2002 SACD or the Mono release. Ultimately, it's nice to have, but I'm really looking forward to the RnR Circus re-release and hoping to high heaven that the packaging isn't as lousy as this 50th anniversary BB, or even as lousy as the first RnR Circus from 1996, with it's funky jewel case and label that almost immediately pealed off the top. Come on ABKCO, you can do this. You can always push the mono button ...the clarity is still there. . I can see how some folks might find a it a bit too different...but I found the 2002 digital re-master to be very hard and to lack transparency. [ But I'm listening mostly on vinyl ...so mileage may differ. To be honest, on one level I'm bloody annoyed ! I might now have to countenance that expensive RS records boxed set, which I had previously written of as a waste of time & money. Maybe there's the odd interesting & refreshing gem amongst those albums too ? Edited 1 time(s). Last edit at 2019-01-04 11:09 by Spud. Come on. Does it REALLY sound miles better than the 2002 SACD? I have that and it's incredible. It's getting better all the time...wonder what's still buried in the original master tapes that only future technologies will be able to reveal - for the next generations of audiophiles. The new one is refreshingly different. When I said the best since the original...maybe I should qualify my comments a little . In terms of the overall effect, and to be a definitive version , it's maybe a little too different from the sound of theold classic album that we all know inside out. That said, those differences offer fresh insights that I think make it a must buy for committed fans. Got it yesterday. It's a bit cheaper put together than the Satanic-release, but it sounds marvelous. After listening to the mono version for a while it took a few spins to get used to the lone bass track in the left speaker during Parachute Woman and the panning in general. A nice release, but they could have given us more. For Satanic they included a booklet, a stereo cd, a mono cd + the album in stereo and in mono on vinyl. The fexi disc-interview and the SFTD mono-single didn't really do the trick. The Rolling Stones Rock And Roll Circus soundtrack album will be reissued by ABKCO in May/June as a 3xLP set, the first time it has ever been released on vinyl. The third disc in the set will be made up of previously unreleased material from the 1968 TV special. Edited 1 time(s). Last edit at 2019-02-05 18:26 by runrudolph. Good information, thanks. Wonder what's the reason for 19th Nervous Breakdown. Maybe there's another release as well? It's a new lyric video to mark the 53rd anniversary of its release in the UK. 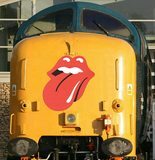 Hi Deltics. That's the only reason? I mean it's kind of cool but they never did that before, did they? If it's TRUE, looks very interesting. There must have been some agreement between the two camps as ABKCO can't just release any unissued stuff. Assuming it covers TV shows, that is. You would think it might have been released in April to tie in with the US tour and therefore gain maximum publicity. Oh, forgot, April is when we get a new Stones album, isn't it? – audio CDs or vinyl editions — including several previously unreleased tracks, most excitingly a brief but previously unreleased rehearsals of the Beatles’ “Revolution” and “Yer Blues” performed by John Lennon with Yoko Ono, Eric Clapton on guitar, Keith Richards on bass and Jimi Hendrix Experience drummer Mitch Mitchell. Sadly, there is no new material from the Stones"
Edited 1 time(s). Last edit at 2019-02-05 21:14 by Deltics. If it is so that ABKCO can't release anything unissued we can never expect anything special from future anniversary releases either? Probably not, partly because any and all unreleased outtakes, works in progress and alternative recordings from 1968 and before are now public domain. They have 11 months to protect any 1969 alts etc. Surely that means then that any 'unprotected' material could then be released without fear of litigation? But, gaining access to recordings is a problem and there's still the issue of copyright for the actual songs. Edited 2 time(s). Last edit at 2019-02-06 13:01 by His Majesty. Good point...but it hasn't stopped lots of the old blues recordings being repackaged time and time again. (for example). Same with stones stuff pre 1969. Some are grey area bootlegs though as they feature protected recordings in amongst the non protected stuff. At the very least, by not protecting their recordings via an official release, ABKCO are leaving things very open for anyone to release them. What they have protected has been rather odd and at times dubious as to whether they have the rights. Edited 1 time(s). Last edit at 2019-02-06 15:01 by His Majesty. In theory then, could a recording of @#$%& Blues finally get a release? It would be in the Public Domain, 50 years since recording fairly soon. The composers would get a royalty fee though. Its listed on the ASCAP database. Strangely, EMI/ Colgems are listed as Publishers of the written song, not ABKCO Publishing. Depends when it was last released officially? If you mean the song, without access to original tape(s), it'd probably just be what ever was used for bootlegs. Edited 1 time(s). Last edit at 2019-02-06 19:46 by His Majesty.